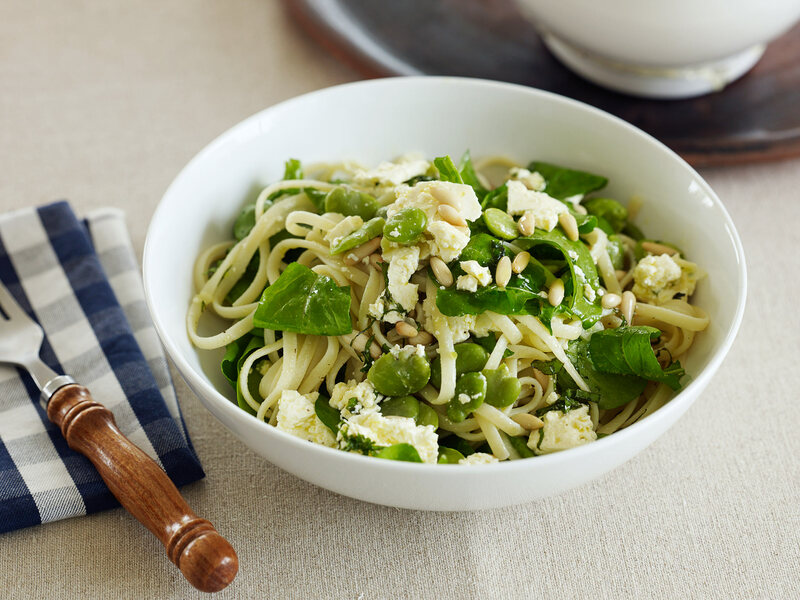 Verdant, crisp, and bouncy fresh, with tangy little bites of feta and salty hits of parmesan. This dish is scrumptious! 1 Slice feta thinly and put it in a shallow dish. Pour over 3 tablespoons oil, grind on plenty of black pepper, and add garlic and mint. 2 If the broad beans are fresh, remove them from their pods and drop them into a saucepan of lightly salted boiling water. Return water to the boil and cook for 7-10 minutes, or until tender; the beans cannot be hard for this dish. Drain and refresh with cold water. If using frozen broad beans, cook in the same manner but for 3-5 minutes only. Flick off the outer skins and discard. Put broad beans in a large warmed bowl and toss gently with 3 tablespoons oil. 3 If using pine nuts, heat a smidgin of oil in a small frying pan (skillet) set over medium heat. Add pine nuts when oil is hot and cook until lightly golden, stirring continuously. Transfer to a plate lined with paper towels using a slotted spoon. Sprinkle pine nuts with sea salt. Cool. 4 Cook pasta in plenty of gently boiling well salted water until al dente. Drain. Add to bowl with beans and oil and toss well. Add cheese, scraping in all the oil. Toss, then add rocket and toss again until rocket is just starting to collapse. Squeeze over lemon, top with pine nuts and serve immediately. That’s lovely to hear Prudence. The wine is worth hunting down. Yes, you must come to the island soon. Julie I made your recipe from your Napier FAWC Masterclass, Spinach, Black olive and Feta Eggah yesterday. It went down really well. How many years ago was that event? Feels like 10 at least. Keep up the good work. Love this website and enjoy it every time it comes out. Thank you Barbara. I love how recipes keep going on. I think this recipe still seems quite exotic after a decade. Loved my time at FAWC and would love to come back.